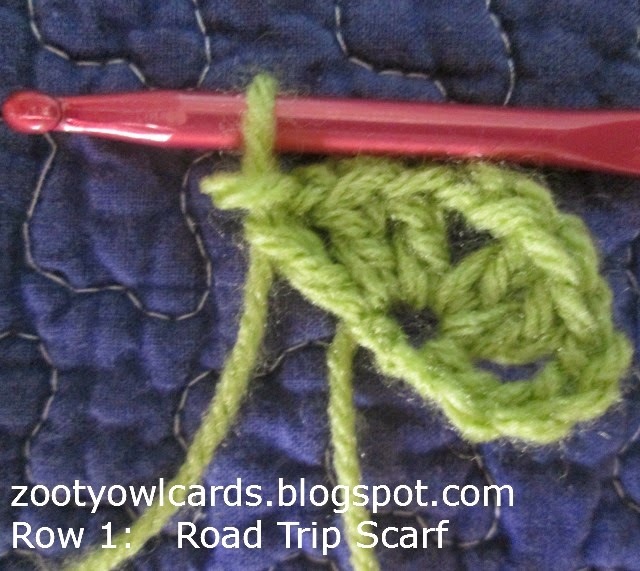 A few crocheters seem to be having a bit of difficulty with the triangle concept for the ROAD TRIP SCARF – so this version is written with more detailed explanations on how to start, getting from row to row, and some useful notes, etc, so that EVERYBODY on the planet can have a Road Trip Scarf!!! The pattern as written (over 34 rows) is designed to be worked in a 100% acrylic variegated yarn (100g / 300m) in DK (8ply /light worsted weight). However, the stitch composition is very uncomplicated - making the pattern suitable for both variegated and solid colour yarns! Various yarn blends also work well with this pattern – 100% merino (wool), acrylic/wool blends and “soft” cottons. Thinner yarns may be used – just keep repeating the pattern row (Row 3) until you reach the required size. Always make sure you end on an even number of rows before starting your edging! Thicker yarns may also be used, although I would not recommend using anything heavier than Aran (10ply / worsted weight), unless you are going to make the scarf substantially bigger. The scarf is worked seamlessly (in one piece) as a single triangle from the top to the bottom - your first row being the top of the shawl which will lie at the base of your throat, and the last row which will drape over your chest. The Point (or corner) is formed in your very first row (2dc, 3ch, 2dc). 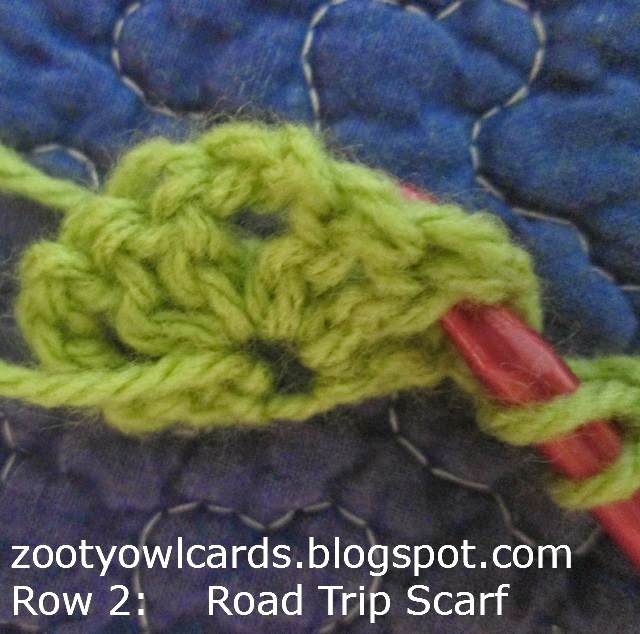 Throughout the shawl you will work 1dc, 3ch, 1dc into the 3ch space from the previous row. If your increases are correct you WILL have a perfect triangle. If the triangle pulls outward - you are increasing too much. If the triangle pulls inward (like a kite) you are increasing too little. 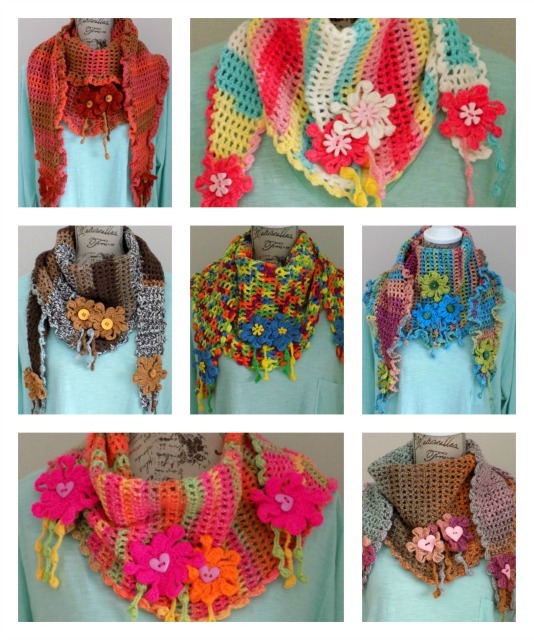 Stitches: We are using two basic stitches only for the scarf - chain (ch) and double crochet (dc) (US terms); UK CROCHETERS will be using a treble and not a double crochet. I am busy working on a detailed tutorial for the EDGING as well - there is, however a video in the original blog post showing how to do the second row. I have also posted the video on my Zooty Owl Facebook page - for those whose browsers cannot load the video from the blog post! The Day Trip Scarf differs from the Road Trip Scarf in that it increases steadily in length and gradually in width, whereas the Road Trip Scarf increases evenly in length and width. Brilliant - thank you for the clarity - I am looking forward to the base edging video now! I have made one already but I had to make up the base edging! I love the pattern though and am on my second now. Thank you for this! On my first one, I actually had the increases wrong - I did an extra chain 1 between the two dc at the ends - but it turned out having a nice subtle batwing curve and I kind of like it that way, I haven't added the border/edging yet so I may have to fiddle with that, too - I'll be sure to post a picture on your FB page when I do! i did read the pattern right! just looked so wrong until i saw the tutorial. Thkyou ....for sharing ....I will be returning again and again ...love that you have pictures for us who don't read .. LOL ..
Christmas gifts aplenty!!! Thank you SO much! This is one of my all-time favorites...thanks so much for going the "extra mile" and making a super understandable tutorial. You're the best! Thanks for the clarification on this page - it helped a lot! The pattern is quite easy once you get the hang of it, and I love how quickly this crochets up. It's a beautiful scarf! I see myself making a bunch in different colors. Thank you for a great pattern! WOW! Thank you SO MUCH for your great photos and help. It took me a couple tries but all of a sudden I caught on thank to your very clear instructions! Having fun with it now! OMG! This is so simple and beautiful. Very good instructions. Caught onto this right away. The visuals are perfect. Was looking for something to do with the Mandala yarn that I purchased, this project was so perfect for it. Thank you so much for sharing your creativity. Hi Thank you for you great pattern and inspiration, have made my first one and will certainly be making more for christmas. thank you for sharing and you have a great blog. I’m a beginner and this will be my first project. Can you tell me how much yarn I will need? Hi and thanks for such a lovely pattern. I took the opportunity to use up some of my wool - I always seem to have a ball left over whatever I make! This being the case, I'm making a sort of irregular, stripey scarf in shades of purple and turquoise. I therefore have joins along the long edge (hypotenuse?) every 2-4 rows. Have you any suggestions as to how I can finish off this edge and make it neat? I've left about 6ins of each colour on the joins. Many thanks. Hi! 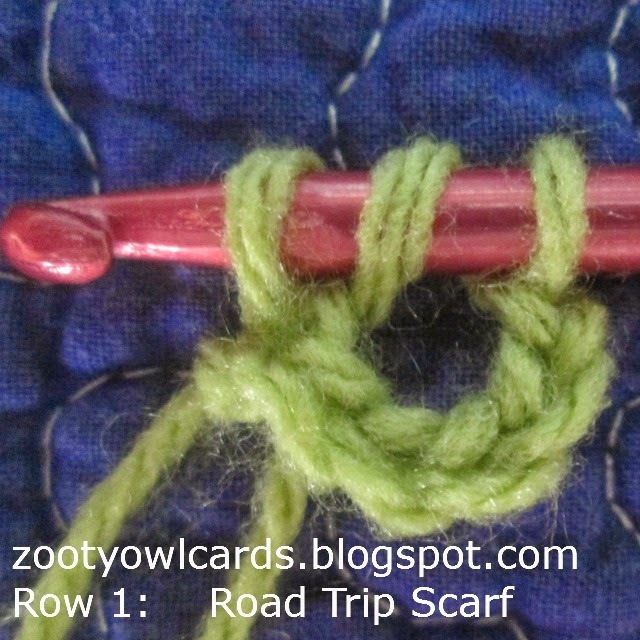 You could switch to a smaller hook and work an edging row of mini shells down the long edge. Starting at the 1 end 2ch, 1dc around dc post, *sl st around next dc post, 2ch, 1dc around next dc post* repeat along edge to next corner.